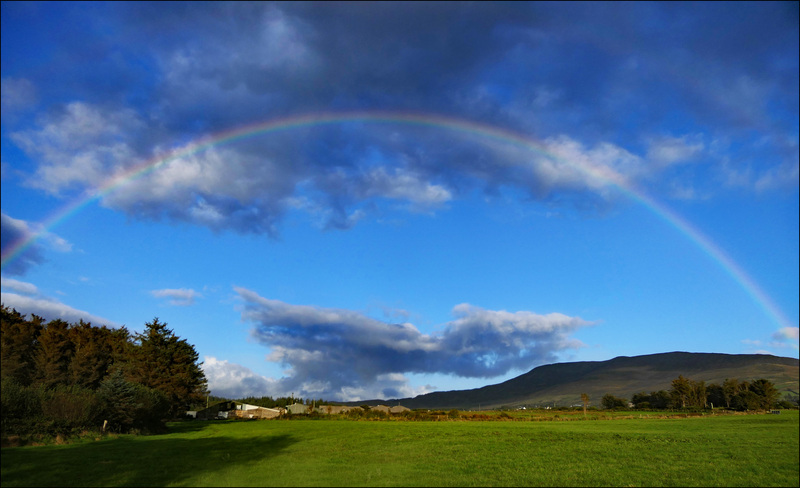 One of the great things about County Kerry in Ireland is that it makes photography easy. Maybe too easy. Basically, you just pull off the road every once in a while, point your camera in a random direction, and take some pictures. They’ll all be great. But let’s start out with something simple. This perfect rainbow greeted us on our first day here. And there was no price to pay, either. The weather was great, with just an occasional light sprinkle. That was enough. By the way, you have Marian to thank for this. I didn’t even notice the rainbow because I was too busy trying to keep the car in one piece. I’m a bit of a leadfoot driver, but the speed limits here are pretty unbelievable. Even on small, twisty roads, the posted speed limit is 60 mph, and I rarely feel safe above 30-40 mph. But the Irish drivers hurtle along even though the lanes are only a few inches wider than the cars themselves and hairpin turns can appear out of nowhere at any time. On the bright side, we’re still alive and I’ve got loads of beautiful pictures. For those of you keeping score at home, this picture was taken in the vicinity of Loher. Today we’re driving up to Portmagee to take a boat tour of the Skellig Islands. The weather is spectacular right now, clear and sunny and nicely cool, so it should be a nice trip. Puffin season is over, to my great sorrow, but I’m sure there will be plenty of other attractions.